Have you ever thought to yourself, "Man, wouldn't my life be SO AWESOME if there were TWICE as much Mister Mercury in it?" Well, fret no more, mere mortals! Because now through November, it WILL! That's right! 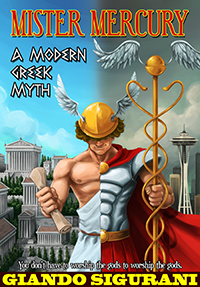 Eat Your Serial will be running Mister Mercury: A Modern Greek Myth TWICE a week instead of just once! Tuesdays and Thursdays to be exact. That's BOTH the days that start with the letter "T." My cover will also be eclipsing my friend Corwin's cover with its pastel-colored, Kent-made awesomeness. And if you've been reading (ha ha, "if"), you'd know that it looks like things are about to become quite exciting in the MM universe! So this is just in time. Now go run home and tell your momma. Print article This entry was posted by Giandroid on 10/24/11 at 09:28:00 pm . Follow any responses to this post through RSS 2.0.